This month is filled with social media and tech learning opportunities. 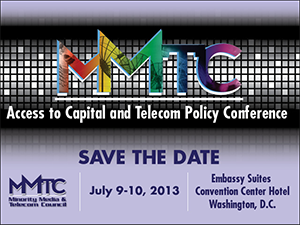 On July 10, I’ll be attending the Minority Media and Telecommunications Council’s 11th Annual Access Capital and Telecom Policy Conference at the Embassy Suites Convention Center and Hotel in Washington, D.C. The theme is “Maximizing Innovation, Inclusion, and Entrepreneurship in a Digital Economy.” I am very excited about two panel discussions. For more information about the conference, click here to see the agenda.